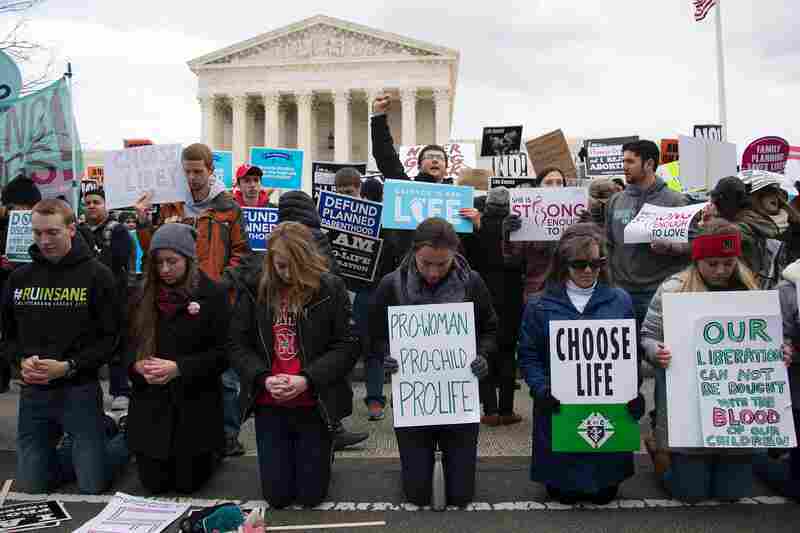 'Choose Life': Politically Opposed Marches, Parallel Messages The "March For Our Lives" and "March For Life" used similar messaging about choosing life, untimely death and speaking out for those who can't. Anti-abortion rights activists gather in front of the Supreme Court at the 44th annual "March For Life" on Jan. 27, 2017 in Washington, D.C. 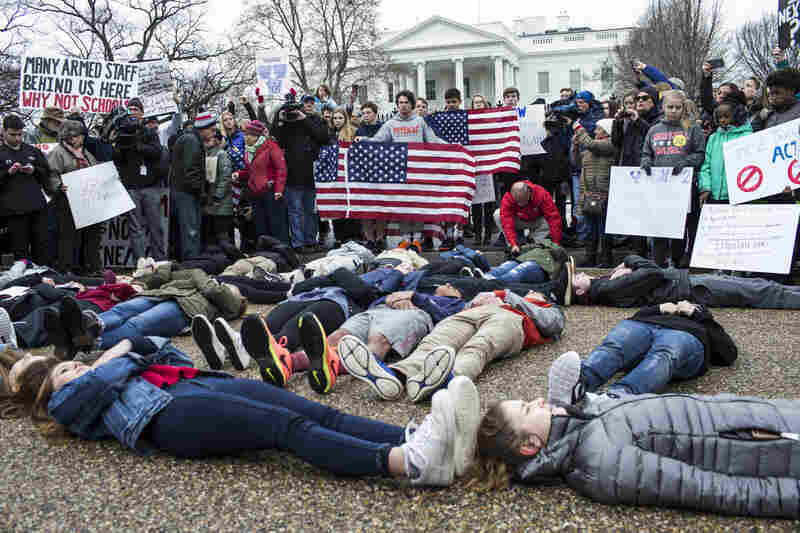 Crowds of people hold signs on Pennsylvania Avenue at the "March For Our Lives" rally in support of gun control, March 24, in Washington, D.C.
Anti-abortion rights advocates participate in a "die-in" demonstration on Pennsylvania Avenue near the White House on Jan. 27, 2017. 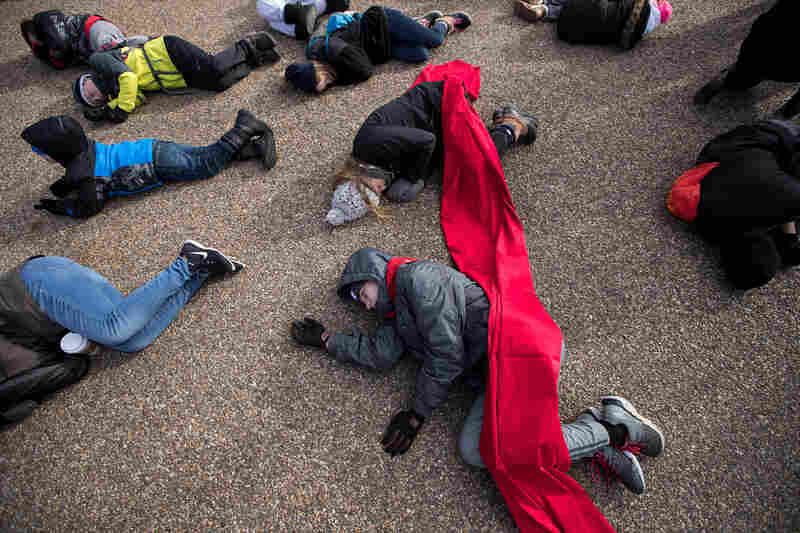 Demonstrators lie on the ground at a "lie-in" demonstration supporting gun control reform near the White House on Feb. 19, in Washington, D.C.
A protester holds up a sign reading "My Generation Is Speaking Up For Those Who Will Never Speak Again" at the "March For Our Lives" rally in Washington, D.C. on March 24. 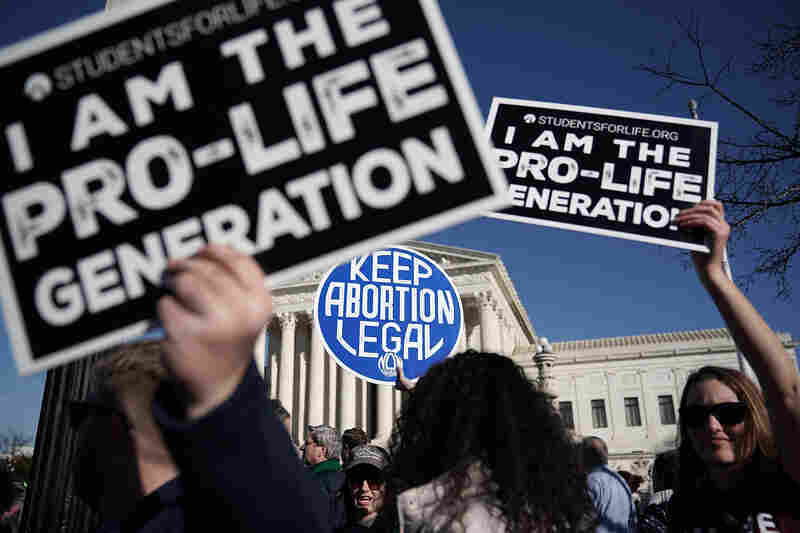 Anti-abortion rights activists hold signs reading "I Am The Pro-Life Generation" during the 2018 March for Life in January. 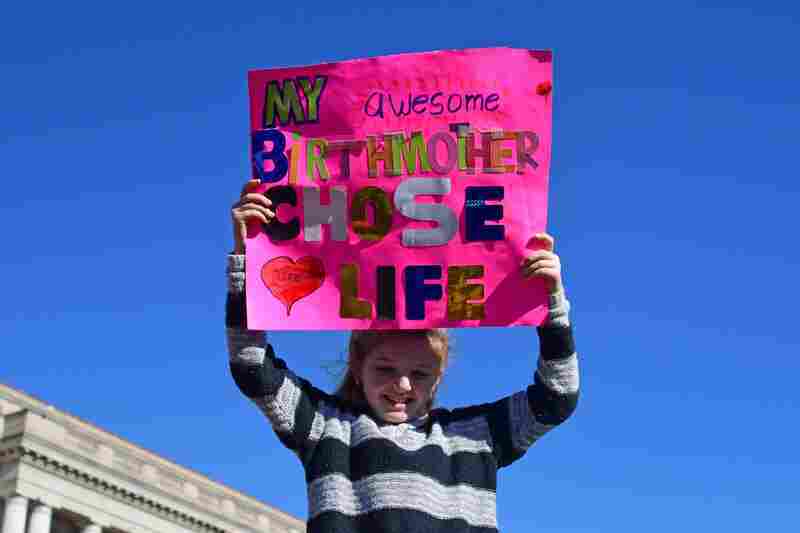 A girl holds up a sign as anti-abortion rights activists gathered in Washington, D.C. for the annual "March For Life" earlier this year. 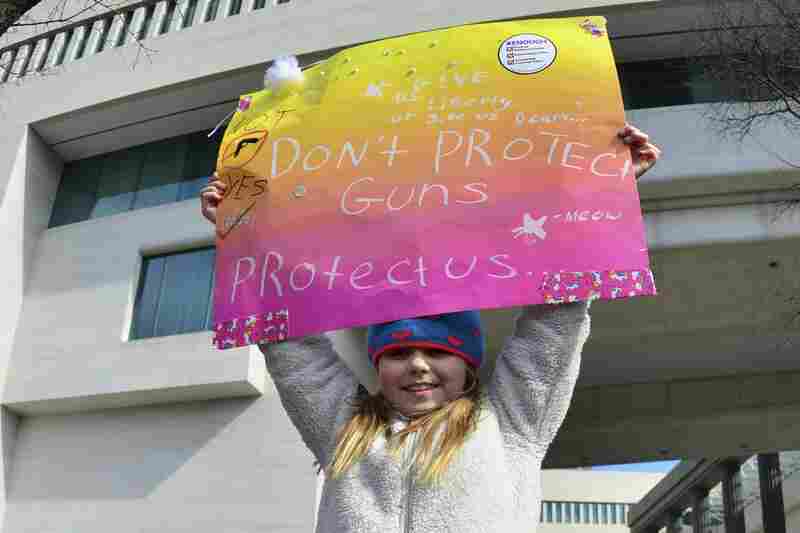 A little girl holds a placard at the "March For Our Lives" rally in Washington, D.C on March 24. 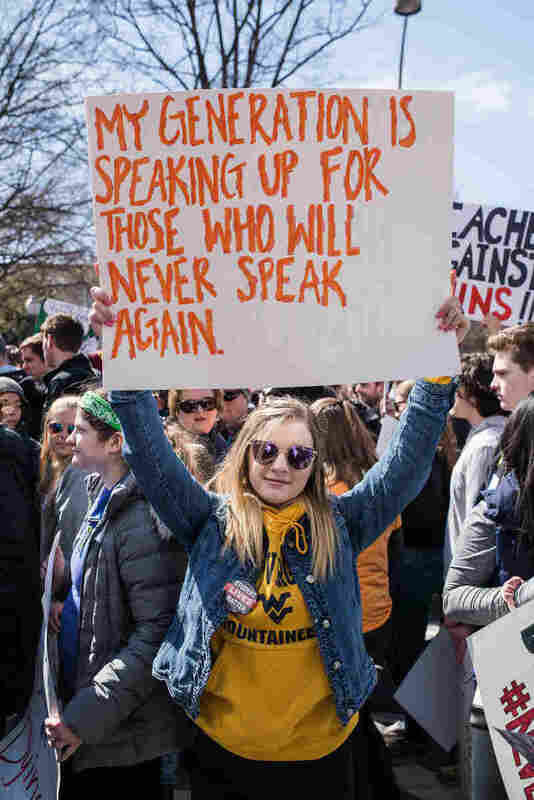 Though they were on opposite ends of the political spectrum, the "March For Our Lives" and "March For Life" occupied the same grass in Washington, D.C., had similar names and more — parallel messaging about choosing life, untimely death and speaking out for those who can't. Last month's March For Our Lives was organized after a mass school shooting in Parkland, Fla. Activists protested gun violence and called for stricter gun regulation. The 45th annual March for Life in January brought together anti-abortion-rights activists. Demonstrators at each held signs reading "Choose Life" and taped over their mouths to represent those who are silenced. 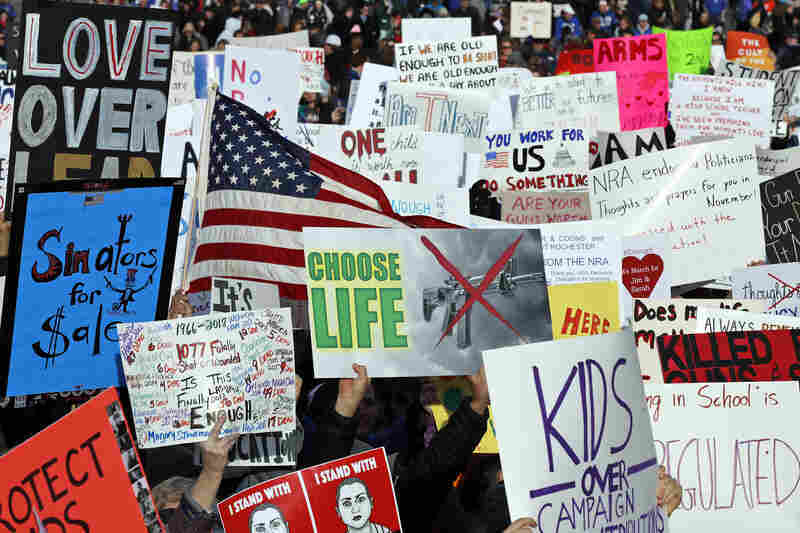 When it comes to gun control activism, there are several messaging frames that haven't worked in the past, says Peter Loge, a professor of media and public affairs at George Washington University who has worked in political communication. "Guns are about personal identity, big business, school safety, hunting," Loge says. "But the March For Our Lives was different. It had children standing up for their own lives." Guns are now in what Loge called a "reframing moment," where activists are recasting the debate from gun rights versus gun control to gun rights versus children's lives. And that is a much more difficult debate for gun rights activists to win, he says. That frame was reinforced as student organizers were interviewed on national TV rather than legislators. "When, instead of adult government officials saying 'we need to save these kids' lives,' it is the students saying 'save our lives,' the movement gains a completely different mobilizing effect," Loge says. "How you enter a conversation determines how you exit that conversation. And if we are beginning this conversation with saving lives, then we will do everything we can to protect those lives. That is an important shift." Messaging around young lives has been used for years in the annual anti-abortion rights rally, March For Life. Young marchers at each event also highlighted the power of being new voters. Loge believes that messaging is effective and gets politicians to listen. "New people, new voters, who are coming out and saying guns are the most important issue to them - that makes politicians pay attention." See some of the parallel messages in scenes of posters and protests from each march above.